Pull on the stretchy pants and get an early start if you want to beat the hungry hordes that will once again invade the Mission for the sixth annual San Francisco Street Food Festival. During this daylong party on August 16, over eighty food makers and restaurants will set up booths to present creative, cheap, global street snacks to an expected crowd of 80,000. La Cocina, a nonprofit incubator kitchen that provides subsidized commercial kitchen space to help low-income and immigrant food entrepreneurs launch their businesses, hosts the event. It alleges this will be the festival's final year in the Mission. While it's easy to overload on steaming momos, fried chicken bahn mi, and curried noodles, save some space for dessert. Excess, meet your incarnation. Build your own frozen custard sandwich starting with one Dynamo Donut split and stuffed with your choice of frozen custard and toppings like cornflakes, ube sauce, and nutter butter. Too tired from all that eating to make a decision? Go with the famed “Mission Style” sandwich. 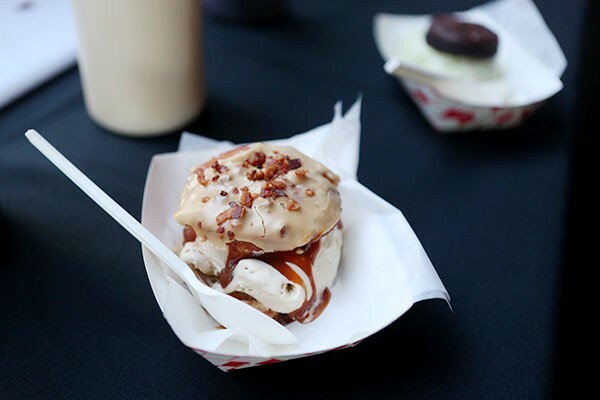 A bacon doughnut stippled with apple bits that have been cooked in bacon fat pairs with Four Barrel coffee frozen custard and a glaze of burnt caramel. It’s a smokey, caloric monstrosity that somehow doesn’t taste heavy. 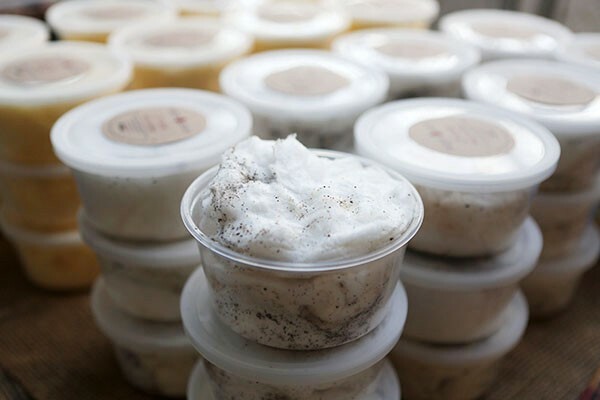 You can also grab plain scoops as well as old fashioned chocolate sodas composed of heavy cream, organic chocolate syrup, and carbonated water. Newcomer Crumble & Whisk manages to make cheesecake exciting without resorting to deconstructionism or bizarre flavor combinations. I Cart NYC has the flavor of a classic New York slice but a fluffy texture that keeps it light. 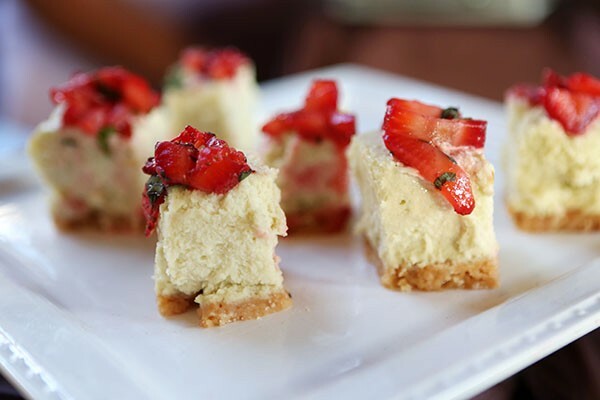 A chopped strawberry basil compote mixed with a bit of ginger drips down the top of each square piece. For a richer option, try the Madagascar Bourbon Vanilla speckled with little black vanilla bean dots. Both fillings rest upon owner Charles Farriér’s thick and buttery homemeade shortbread crust. One taste, and you'll wonder why graham crackers have dominated the cheesecake crust market for so many years. The carnival classic returns and tastes even better than it did when you were a kid. 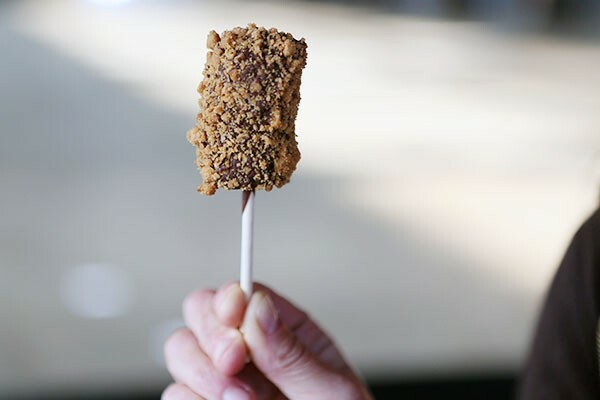 Order your creamy, cold banana in a dark or milk chocolate cloak with or without crumbles of Cristina Arantes’s buttery coconut shortbread cookies ("with" is the correct choice). If the fog decides to party crash, try Cristina's hot chocolate spiked with cinnamon, nutmeg, clove, and a twinge of chile or her famed homemade marshmallow s’mores, torched onsite and slid between one plain and one chocolate-covered caramelized graham cracker. 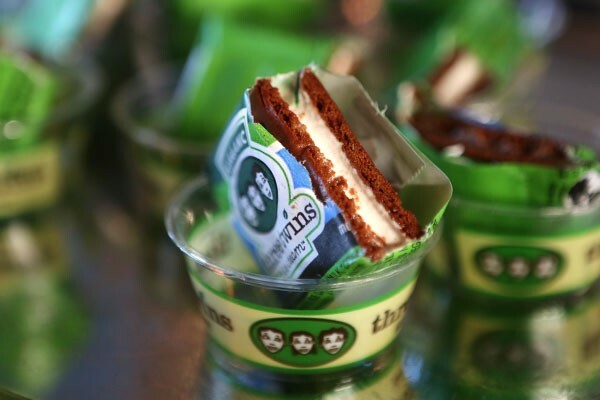 Party like it’s 1990 with an ice cream sandwich reminiscent of the kind served at your childhood pool parties. Organic madagascar vanilla ice cream squishes between two soft homemade chocolate wafer cookies. Alternatively, you can go with a scoop of one of Three Twins’s new flavors: chocolate chip cookie dough, land of milk and honey, or brownie batter chunk. La Luna's customers clamor for tres leches. Rich vanilla cake soaks in three kinds of milk—evaporated, condensed, and regular—giving it a milky pocket that’s not quite wet, but goes a step beyond moist. 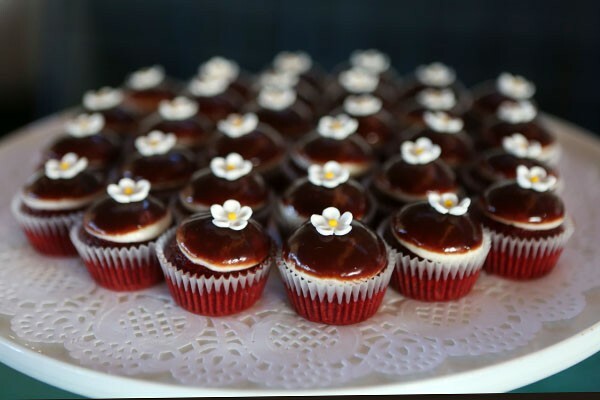 At the festival, owner Elvia Buendia will also serve her popular red velvet with cream cheese frosting and smear of chocolate ganache (pictured), summery strawberry, and chocolate mint. For something more portable, try a cake pop. These orbs of blended cake and frosting served on a stick get dunked in white chocolate and sprinkles to resemble decorative golf balls. 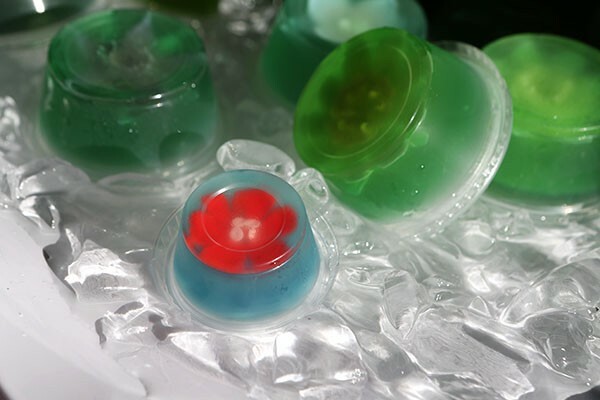 Art and booze collide in these jello shots for classy folks. Rosa Rodriguez uses a small knife to etch flowers into each one, which she pumps with milk custard. At the festival, she’s juicing them with tequila and flavoring each with lemon and grapefruit. 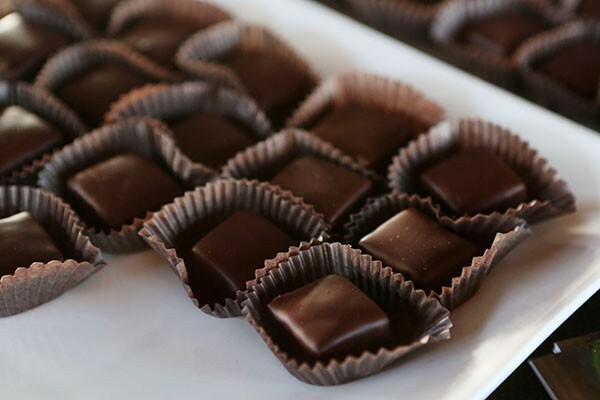 Chopped organic almonds stud these squares of buttery toffee wrapped in dark Guittard chocolate. A salty finish lingers thanks to Esprit du Sel (grey sea salt) that's cooked into the candy. Nosh This will also sell its beloved bacon crack made with applewood-smoked bacon from Zoe’s Meas. You’ll find single pieces, boxes of four, and bags of Crack Rocks. Put a wad of this grownup cotton candy on your tongue, and feel it melt almost instantly. Dots of cayenne fleck the light yellow Spicy Salted Mango which makes it look more menacing than it tastes. Biscoff Spread and streaks of ground Oreo-like cookies (Sugar & Spun uses the 365 brand from Whole Foods) look like black pepper riddling the Cookies and Cream flavor. Find pre-packed containers of the above as well as Peanut Butter & Jelly. Or, order yours spun on-the-spot in options that include Nuetella strawberry, chocolate black sesame, and matcha green tea latte. Follow Alissa Merksamer on the blog Glamorous Snacker or twitter @glamsnack.